Welcome to our weekly recap! This one's for October 3rd - 9th, which is week 40, 2014. 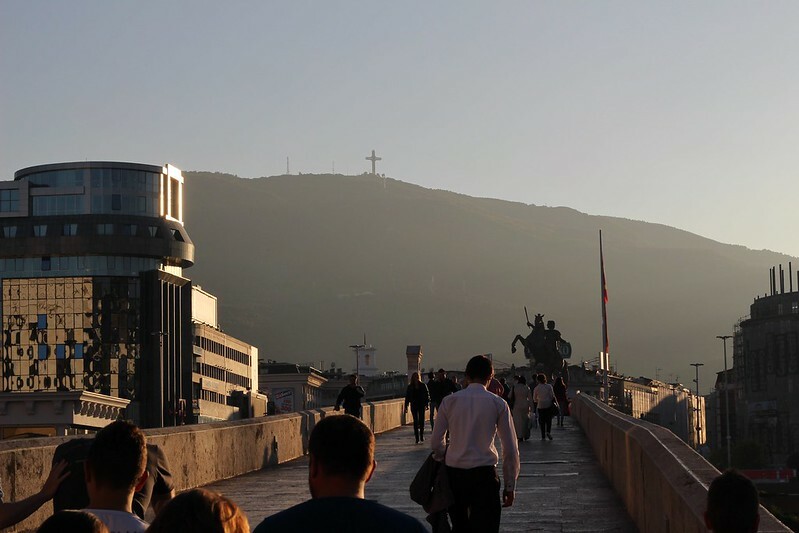 Surprise of the week: Last week I wrote about the Skopje 2014 project, but only now I start to realise the magnitude of it. 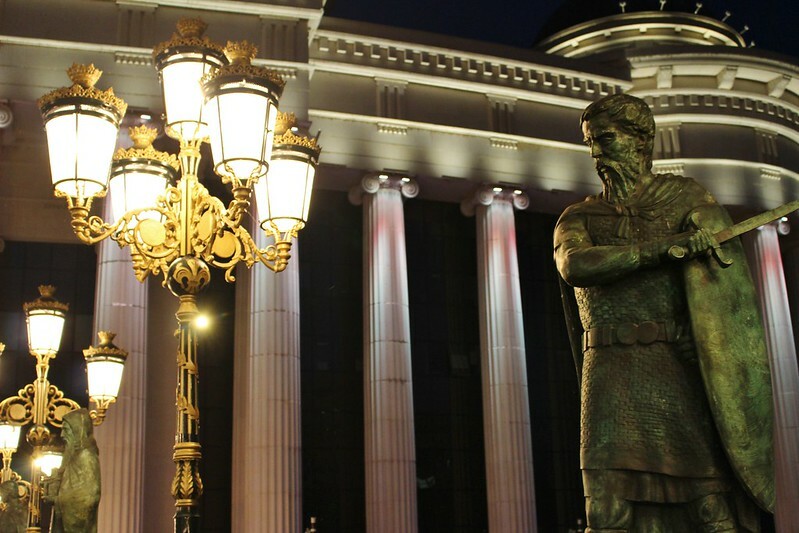 In the center there are huge new buildings that look like something from ancient Rome, new bridges with tens of lifesize statues on each, and monuments after monuments everywhere you look. It somehow feels like walking through an amusement park, unreal. What I like the most are some small statues that exhibit more modern, every day life. 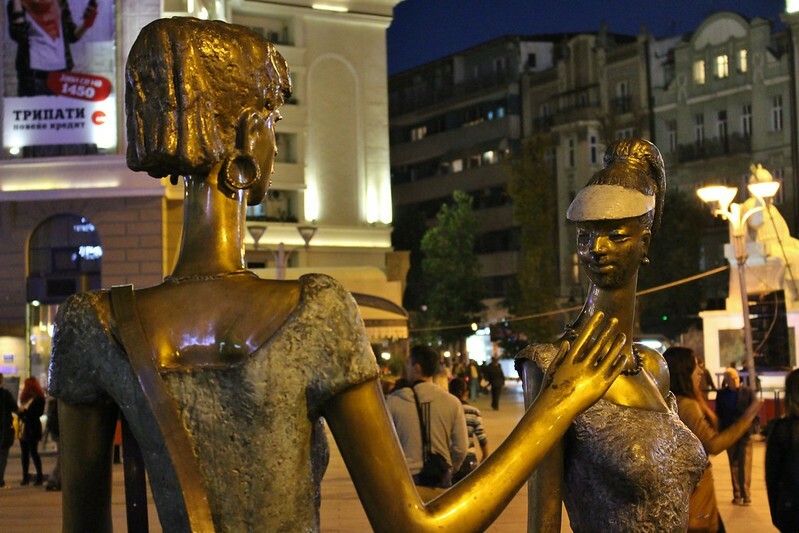 Like the two girlfriends on the corner of the shopping mall on Macedonia square or the lady bathing in the river. 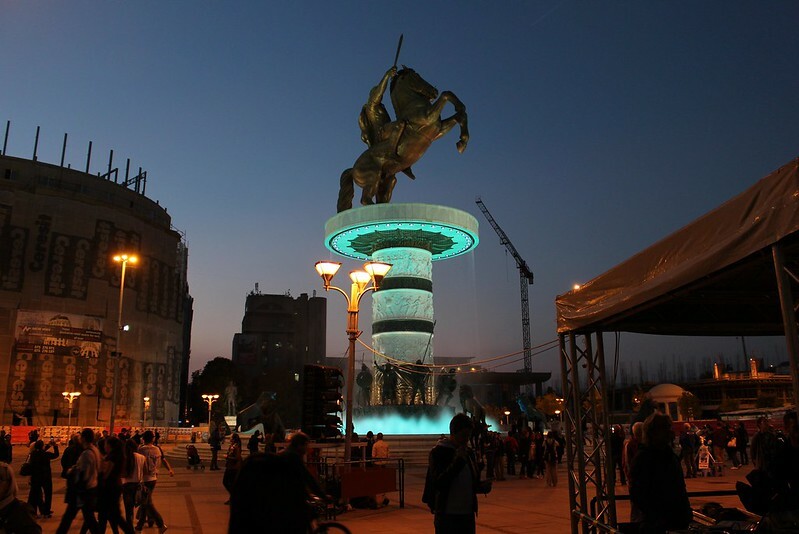 Memorable moment: On Saturday the White Night event took over the central Skopje. 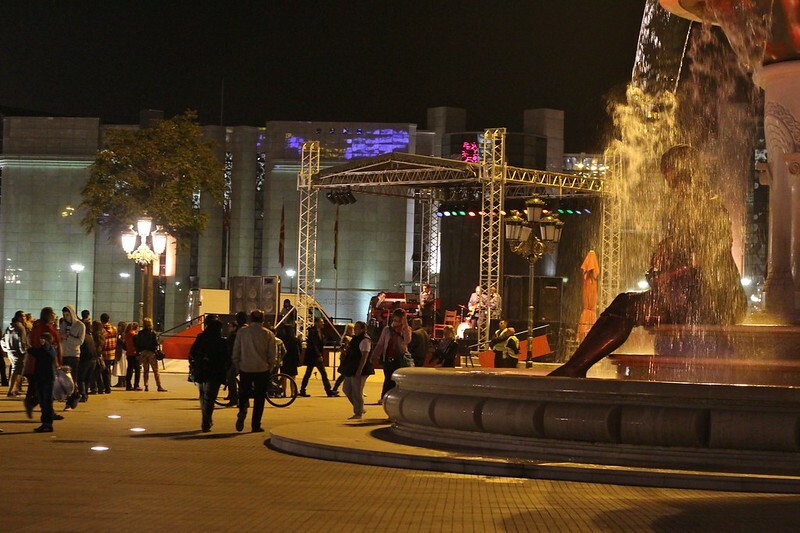 There were several stages for live music, artwork on the streets and free entrance to museums. 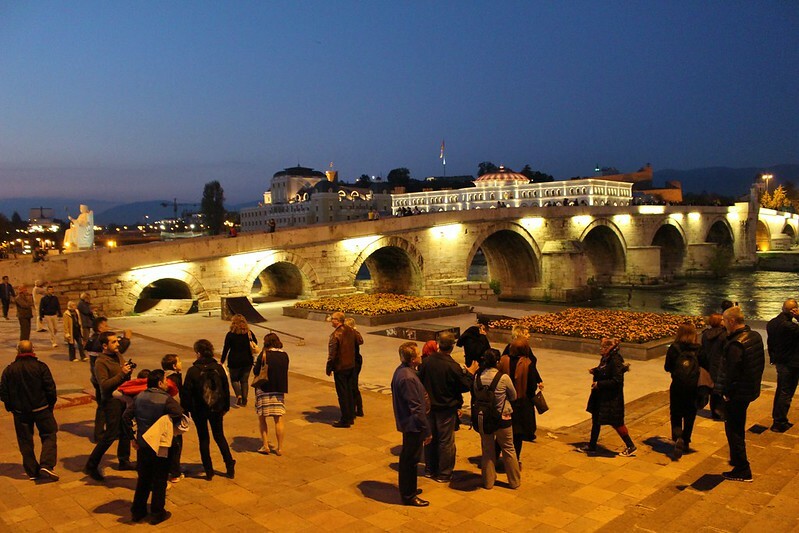 This, together with a nice autumn night, lured plenty of people to take a walk and enjoy the sights. My most memorable part was sitting on a terrace, a cold beer in my hand and the tunes from a jazz band playing on a nearby stage in my ears. Lights played in the fountains and people were strolling by with smiles on their faces. Tip of the week: A flu brought me down this week and I spent few days on the sofa not able to do much. That's a time when some good tv-series, like Gilmore Girls (one of my all-time favorites) would be just perfect. In a hypothetical situation that one has both Netflix and an VPN, one could connect to the US Netflix and watch some episodes (since the Netflix selection changes from country to country). Food love: Yesterday our Airbnb host took us out to try some Boza, a fermented (non-alcoholic) drink traditional in this corner of the world. It definitely wasn't what I expected and the taste is hard to describe. It's sweet but acidic, thick but refreshing. After having a couple of mouthfuls and trying to figure it out I came into conclusion that I really do like it. And so I ordered a second glass. I was told that Boza is always homemade and sold only in specific places (ask around to find out where), and you can either drink it right there or buy a bottle to go. Boza contains lot of vitamins B and A, as well as lactic acid. So it should be very good for your stomach and make your skin glow. And, according to Wikipedia, Boza has also been alleged to have an ability to enlarge women's breasts. 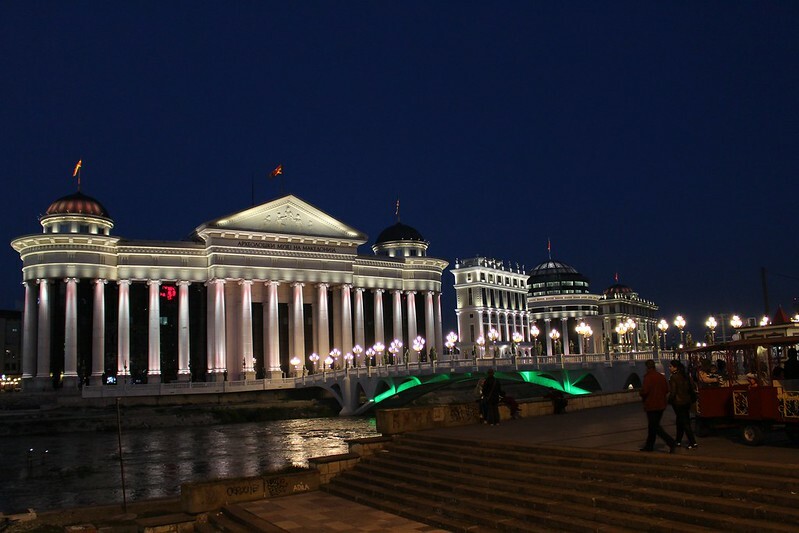 Random thought: There's a lot of latin music playing in Skopje. I have no clue why it is so popular, but I'm not complaining. What I've learned: There are so many cities in Europe that claim to be The Place for Christmas markets. Dresden, Brussels, Nürnberg, Strasbourg, Vienna, Prague, Budapest, ... On our way from Turkey to Finland for Christmas, I want to stop somewhere in Central Europe for few days to immerse ourselves in some Christmas spirit. Not so easy to choose. At the end, after weighting in the cost level, available flights and hotel selection, I ended up booking us for 3 nights in Prague. Workwise: Antti is very happy with his working space here at our Skopje apartment. His desk is a bar table, and he can easily switch between sitting down and standing up while working. Which should be very good for your health. I, on the other hand, like to work sprawled on the couch, chiropractor's nightmare style.